1.The Chairman, Teachers Recruitment Board, 4th Floor, E.V.K.Sampath Maligai, DPI Compound, College Road, Chennai ? 600 006. 2.The Expert Committee, (Chemistry) Teachers Recruitment Board, 4th Floor, EVK Sampath Maligai, DPI Compound, College Road, Chennai ? 600 006. 1.The State of Tamil Nadu, Rep. by its Secretary, School Education Department, Secretariat, Chennai. 2.The Chairman, Teachers Recruitment Board, 4th Floor, E.V.K.Sampath Maligai, College Road, Chennai ? 6.
: Respondents in WP(MD).No.16164 of 2017 PRAYER in WP(MD).No.15953 of 2017: Writ Petition is filed under Article 226 of Constitution of India, praying for issuance of a Writ of Mandamus, directing the second respondent to provide additional marks to the petitioner in connection with Question no.14, 15, 22, 45, 72, 102, 103 for the post of PG Assistants(Chemistry) in Tamil Nadu Higher Secondary Schools. PRAYER in WP(MD).No.16068 of 2017: Writ Petition is filed under Article 226 of the Constitution of India, to issue a Writ of Mandamus directing the first respondent to award marks for the questions in Serial 'A' Question numbers 3, 10, 15, 22, 25, 43, 44, 63, 72, 79, 99, 103, 110 and consequently direct the first respondent to call the petitioners to the Certificate Verification for the post of Post Graduate Assistants (Chemistry) within the time stipulated by this Court. PRAYER in WP(MD).No.16163 of 2017: Writ Petition is filed under Article 226 of the Constitution of India, to issue a Writ of declaration, declaring the final key answer provided for the question paper in Chemistry CDE-2017 Booklet series 'A' pertaining to Question Nos.25, 43, 44, 63 79, and 103 provided by the second respondent as incorrect and consequently to direct the second respondent to award marks for the above said questions and to declare the petitioner bearing Roll No.17PG06050334 to have passed in written examination and allow him to participate in the certificate verification within the period that may be stipulated by this Court. PRAYER in WP(MD).No. 16164 of 2017: Writ Petition is filed under Article 226 of the Constitution of India, to issue a Writ of declaration, declaring the final key answer provided for the question paper in Chemistry CDE-2017 Booklet series 'A' pertaining to Question Nos.25, 43, 103, 3, 44, 63 & 79 provided by the second respondent as incorrect and consequently to direct the second respondent to award marks for the above said questions and to declare the petitioner bearing Roll No.17PG08050382 to have passed in written examination and allow him to participate in the certificate verification within the period that may be stipulated by this Court. Aduththu tet velaiyum then pgtrb velaiyum nadaiperumaaaa.??? Ethukku final list..????? 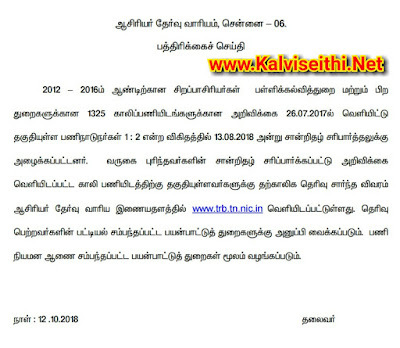 ?spl teachers kkaa..???? உத்தேச லிஸ்ட் கொடுத்திருக்கிறார் கள் மீண்டும் ஒரு லிஸ்ட் வெளியிட வாய்ப்பு உள்ளது.ஏனென்றால் அனைத்து பிரிவுகளிலும் reserved என்று கொடுக்கப் பட்டுள்ளது.ஆகவே நடப்பு காலிப்பணியிடங்களை ஒவ்வொரு பிரிவிலும் அரிவித்தபடி வெளியிடாமல் உத்தேச பட்டியலை trb வெளியிட்டுள்ளது.ஆகவே அந்தந்த பிரிவுகளில் பெயர் இடம் பெறாதவர்கள் trb யிடம் நேரில் சென்று திங்கட்கிழமை காலை விபரம் அறிய வேண்டும்.